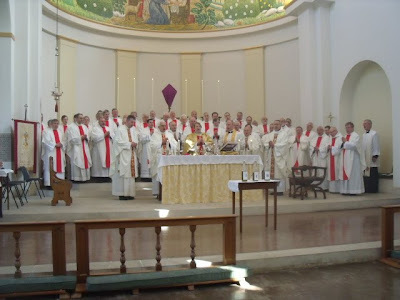 Some thoughts on the Chrism Mass which was celebrated today at Holy Nativity Church, Bristol, UK. The Bishop of Ebbsfleet welcomed us Welsh pilgrims currently orphaned of a Father in God (although our retired 'father' Bp. David was there at the altar and despite some health problems in fine form). Apart from the mobile ring tone of Bp. Andrew going off at noon for the Angelus (therefore very forgiveable) it went without a hitch!! There were 60 priests robed (about 26 Welsh) plus some further 18 priests in the congregation of around 360 faithful. A moving and poignant occasion not least because it will be the last for many as Church of England and Church in Wales Anglicans. One doubts that there will be another of this type and scale again. Thanks to the 'pastoral care' of the bench of Welsh Bishops and the soon to follow-suit diktats of the General Synod this will not happen again on this scale if at all. But we were not sad, not defeated, quite the opposite. In the words of S. David 'be joyful keep the faith' was in our hearts. There is a lovely air of caravan moving through the desert atmosphere at the moment. For what can we fear if we know that the call of God is with us. The things not of God will not have any fears for us and each will discern what the Spirit is saying to him and his vocation. Is it real? Is it of God? Where am I being called to decide on my future place in Your Kingdom? Our vows renewed, the Holy oils and the oil of gladness replenished we are now fortified for now by Holy Church to fight the world, our sins and the devil to proclaim the wonders of salvation won for us by the crucifixion of Christ in these coming days of Holy Week and the resurrection festival of mighty Easter, when soon we will be able to proclaim the 'A' word from the rooftops again! New hope, new spring, new dawn. Perhaps the most beautiful words of the season other than the forthcoming Exultat are these from the consecration prayer of the Holy Chrism the Bishop having movingly breathed three times the breath of the Holy Spirit onto the oil soon to become Holy Chrism. God our maker, source of all growth in holiness, accept the joyful thanks and praise we offer in the name of your Church. In the beginning, at your command, the earth produced fruit-bearing trees. From the fruit of the olive tree you have provided us with oil for holy chrism. The prophet David sang of the life and joy that the oil would bring us in the sacraments of your love. After the avenging flood, the dove returning to Noah with an olive branch announced your gift of peace. This was a sign of a greater gift to come. Now the waters of baptism wash away the sins of men, and by the anointing with olive oil you make us radiant with your joy. And so, Father, we ask you to bless + this oil you have created. Fill it with the power of your Holy Spirit through Christ your Son. It is from him that chrism takes its name and with chrism you have anointed for yourself priests and kings, prophets and martyrs. Make this chrism a sign of life and salvation for those who are to be born again in the waters of baptism. Wash away the evil they have inherited from sinful Adam, and when they are anointed with this holy oil make them temples of your glory, radiant with the goodness of life that has its source in you. Snap! Thank you, father. 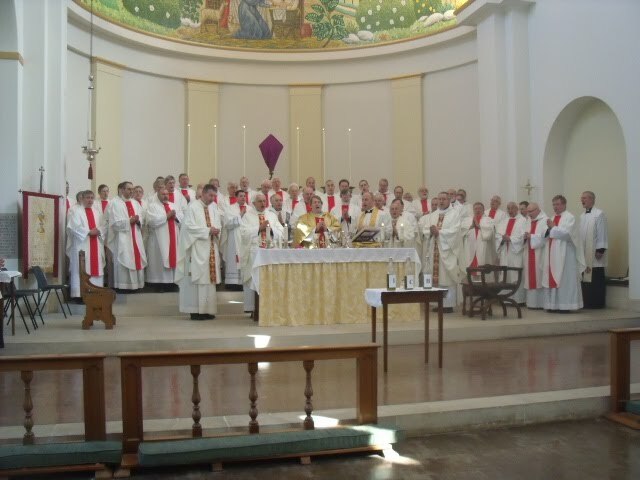 you may very well be able to say you deaconed the last Ebbsfleet Chrism Mass - particularly well I have to say!